Traditional supply chains weren’t built with today’s globalized system in mind. So it’s not surprising then that legacy supply chain systems struggle to cope in today’s turbulent geopolitical and economic landscape. Today’s business challenges include volatile consumer demand, supply chain visibility, shifting consumer expectations, managing omnichannel operations and changing trade policies. As a result, companies are seeking new digital solutions to make their supply chains more efficient, streamlined and future-proof. The CGS 2019 ERP and Supply Chain Trends Report discovered that according to business leaders, “Responding Better to Challenges and Disruptions” is the top priorities for their Planned Business Improvements. 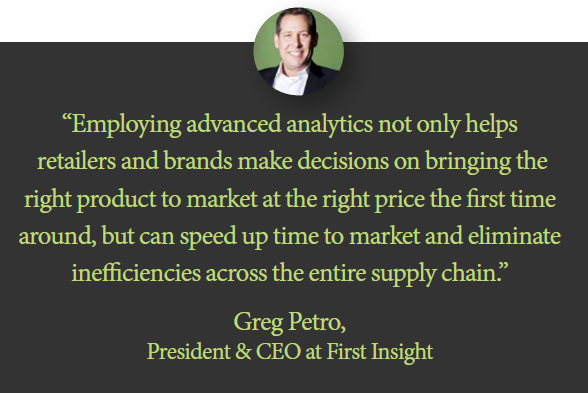 A few future-oriented companies that have heard this call have begun to realign their priorities and trained their sights on optimizing their supply chains through the power of supply chain analytics and predictive strategies. Winning the supply chain battle largely comes down to technology innovation. Late last year, in an article in Forbes, Spencer Fung, the CEO of Li & Fung, made the bold prediction that the retail supply chain will become fully digitized. He went on to say that: “the future of supply chain will be driven by speed, digitization and a new approach to design and product development”. It’s not just Spencer Fung who seems to believe in this idea. CGS’ report shows that “Supply Chain Visibility and Management” tops the list for organizations when it comes to their Supply Chain Challenges. As a result, companies have recognized that the most significant technology contribution to business processes is their Enterprise Resource Planning (ERP). An integrated ERP can leverage advanced analytics to help companies react faster and more proactively to change, improve supply chain visibility, and control, manage and mitigate costs. With a data-driven ERP system, supply chains become a primary source of valuable, raw business data that can help businesses improve visibility and management. Improved visibility, in turn, drives better decision-making, particularly when it comes to allocating resources, optimizing speeds and improving customer service. With advanced analytics, a data-driven ERP system can help businesses enact the end-to-end control needed to accomplish these goals. For apparel and fashion companies, this means that every step, right from the design stage to mass distribution, can be planned to meet customer expectations and optimize operational efficiencies. This is a critical necessity for industries that wish to stay agile in an otherwise turbulent marketplace. However, anticipating customer needs can be challenging, especially in fashion where viral trends can suddenly emerge and force abrupt shifts in every stage of the supply chain. An important way to stay ahead of such consumer-driven disruption is to develop the ability to forecast and predict customer’s demands. This is where predictive analytics steps in and open up a whole new world of possibilities. Companies can achieve true integration across the supply chain by connecting various operations along the supply chain. Processes such as financial accounting and distribution, integrated merchandise planning, inventory and warehouse management, omnichannel fulfillment support, product development, production management, sourcing and order management, are all easily integrated into ERP systems for true end-to-end supply chain visibility. A fully integrated ERP can track changes across a supply chain in real-time and help companies make strategic and proactive decisions. This approach can even allow companies to know “what” the customer wants even before the customer knows themselves. Predictive analytics allow companies to analyze vast amounts of data from the connected processes to unearth insights into their future. This approach is powered by emerging technologies like machine learning and artificial intelligence that can anticipate customers’ needs and allow businesses to access new business opportunities. Such integrated supply chains can use predictive analytics to also improve visibility into consumer behavior and consumer buying trends in real time. Major brands such as Marks & Spencer and Rue21 are already using predictive analytics to improve their bottom line and enhance operational efficiency. In the case of the UK-based global retailer, Marks & Spencer, their business solution uses consumer-driven predictive analytics to drive decisions on aspects of design, buying and pricing for a wide variety of goods, such as apparel, accessories, beauty, home, food, footwear and lingerie. Similarly, Rue21 uses analytical tools to predict which designs consumers might prefer in the future and more importantly, at what price point. Using this kind of business intelligence, the company is able to get their product assortments lined up far earlier in the process and improve their speed-to-market. In both these cases, the role of analytics-driven solutions allows companies to streamline their operation, stay on top of emerging trends, enable proactive business strategies and increase speed to market. Such real-world examples are just the beginning as the potential of predictive analytics can radically change the manner in how consumers shop and businesses product. Until the 1990s, apparel and fashion were slow moving businesses with regular, seasonal cycles of production and distribution. But the last 20 years has seen the rise of fast fashion – cost-effective, trendy clothing produced rapidly by mass-market retailers, and this has led to a retail revolution with more designs, changes and options than ever before. With these changes, the biggest retail disruption has been the rapid changes in customer behavior and the sudden spike in customer expectations. But with a fully digitized, data-driven, analytics enabled supply chain companies have the chance to keep up with this change. By integrating predictive analytics across an omnichannel supply chain, businesses can see into the future of their wholesale, retail and eCommerce channels and operation. Not only does this allow companies to cater to rising customer expectations but also gain the ability to become more aware of the broader challenges headed their way. Learn more about these challenges and what lies in store for the future by downloading the full report - CGS’ 2019 ERP and Supply Chain Trends.